Monkey and The Frog: Happy Fathers Day!! Today here in the US we celebrate father's day so this to all those wonderful dad's out there. Enjoy the pics below, the first one of myself with dad in Malaysia, taken on April 4th 1981. The second one is of Phil with the kids, also taken some time in the 80's. Oh my how time flies. Oh man! A couple of fashion victims of the 80s! 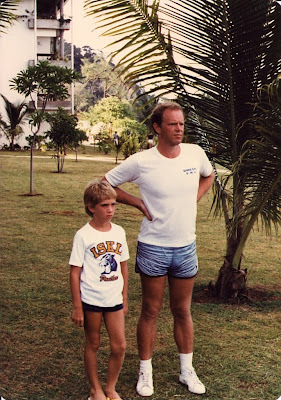 I am not sure which is better: Peter's short shorts, or my bad feathered hair with the white shades on my head. And nice 'thumbs up' from my brother! But if there is one thing I remember, it's that those Baskin Robbins ice cream cakes were the best! 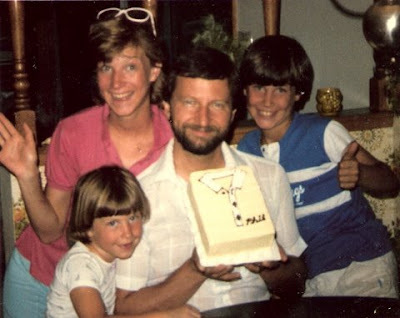 Especially those special edition Fathers Day 'shirt cakes! Good stuff! Peter - those shorts are hot! You should bring that look back. Oh man! Eeps you kill me! That is hilarious!